In large HOA and community parks dotting the country you are seeing a wave of splash pads / splash parks being built. 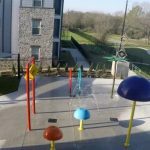 The unique designs, incredible safety aspect, and the reduced cost in contrast to a public swimming pool drive splash pad popularity. Rain Deck commercial splash pad / splash park product line gives you a complete menu of water features to choose from to draw in the crowds to your new public park splash pad. Browse Rain Deck’s stainless steel water features and buy with confidence because our products are engineered and manufactured to keep up with the intense use that comes from the masses that will enjoy your public park splash pad / splash park. With the assistance from one of our splash pad specialist we can help you plan within your budget and help you look to expand your splash pad above ground water features in the future by incorporating Rain Decks interchangeable footing bases that today can be used as spray jets and when you are ready to expand you can install an above ground feature quickly. Our splash pad sales representatives are ready to assist with any need you have to achieve your goals to install a splash pad in your public park. Fill out the form or give us a call to see how we can help you put together your dream splash pad for your large hoa and community parks site! 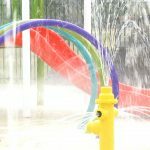 Below are the latest blog posts and news items about our residential, light-commercial, and commercial splash pad products. Splash Pad | Chesterton, IN.